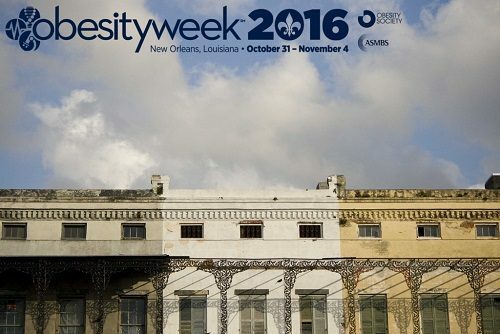 The world’s leading experts in surgical obesity care will be presenting the latest advances in surgical obesity care at ObesityWeek beginning Monday in New Orleans. Already one of the most potent tools for treating obesity, surgery is evolving into a critical tool for putting type 2 diabetes into remission. Oliver Varban will present on what patients and referring physicians should know about outcomes for bariatric surgery (Abstract A106). Verban will address the likelihood of achieving a body mass index (BMI) that takes a patient out of the range of obesity. Alex Michaels will describe 30 years of outcome data on hypoglycemia after bariatric surgery (Abstract A103). John Mortimer will present results from the the first national quality-improvement collaborative from the new ASMBS accreditation program, an effort aimed at reducing hospital readmissions (Abstract A101). Wendy King will speak about a seven-year study of substance use and misuse among adults following Roux-en Y or laparoscopic adjustable gastric banding (Abstract A104). Marie Menke will discuss a seven-year study of contraception and conception following bariatric surgery (Abstract A107). These and the rest of the ten best papers from ASMBS will be packed into two sessions beginning Wednesday at 10 am next week in New Orleans. And then at the end of the week, an hour-long keynote discussion session will focus on the challenges of weight loss and regain with bariatric surgery and the full range of evidence-based obesity care. Using a case-study format, the panel will engage the full range of attendees: basic scientists, neuroscientists, clinicians, surgeons, population researchers, and policy makers. The panel will include a remarkable collection of the top experts working on diverse aspects of obesity. Find the full schedule for ObesityWeek here and more perspective from MedScape here.